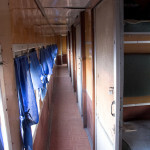 I love trains and when we’re travelling, if there are trains available, I’ll look at using them to get about, especially if I can save us a night’s accommodation in the process. However, the over-riding consideration is that they must go where we want them to go, and approximately when we want. It was therefore with some trepidation that I factored two train trips into our much anticipated visit to Myanmar recently. Having read everything I could find, which wasn’t much and was mostly out of date or had lots of ‘can’t guarantee this is correct’ comments, I put on a brave face and convinced my travelling companions that all would be well. I have to say that I pulled the correct straw out of the bundle. Phew. 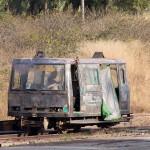 The trains ran where we wanted and when and had sleeper cars attached. So. 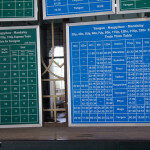 Here is the latest information on travelling by train in Myanmar as at January 2013. First rule. You need to buy your tickets in your town of departure. Don’t panic, there should be seats available, at least our trains were not overbooked. 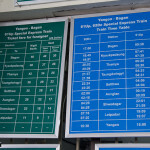 The latest timetables and fares are posted below, it will cost you USD33 for a ticket Yangon to Mandalay, and despite it stating that Bagan to Yangon is USD50, we only had to pay USD40, plus $2 to the agent. You don’t go to the station to buy though. 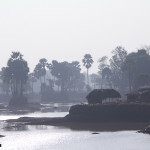 In Bagan, that is miles out of town and going there once is enough. 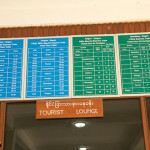 You can buy your tickets from the agent in Nyaung U, your hotel should be able to point you in the right direction. 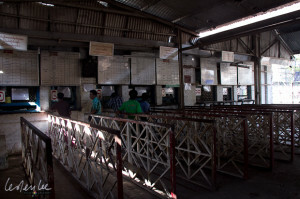 In Yangon, the ticket office is a very dark building directly over the road (Bogyoke Aung San Road) from the Sakura Building. You will need your passport and nice crisp USD. Get to the station at least half an hour early and you can make yourself at home once you are able to board. 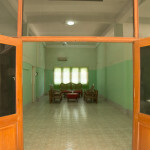 There is a tourist’s waiting room in Bagan, but it looked like it had never been used and anyway, the platform was much more interesting. The trains are all pretty old and look like they are originally from Malaysia. At least the sockets in the Yangon / Mandalay ones were, they had SIRIM stickers. You will be hassled by chaps taking your dinner orders (7000Kyat) in Yangon, delivery at 7pm, but not in Bagan. You should take food and plenty of drinking water. We loaded up with individual packs of biscuits and fruit we bought at the market so we were fine. 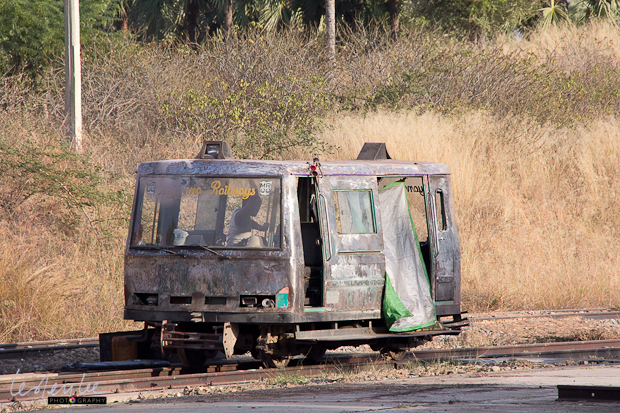 There is a restaurant car, but we didn’t actually go to investigate, though the food apparently came from there on the Yangon Mandalay journey. Take something warm, jackets, a sarong to wrap up in, extra socks. They give you a thin sheet, but it gets really cold and you will welcome every extra layer you can find. This is the cooler part of the year, mid-year might be the opposite. The trains aren’t air conditioned, it’s all natural aided by a ceiling fan if you need it. We didn’t. You will get a free massage during the trip. You get rocked side to side, front to back and fishtailed. Or if you prefer, it messes with pitch, roll and yaw. But the ‘best’ is the up and down. NOT! Our carriage Yangon / Mandalay obviously had a faulty spring somewhere, so everytime there was any reasonably hefty bump, the up & down movement took on a life of its own and intensified. One of our group ended up with a nasty bruise on his hip as a result. On the whole, I would have to say it was a positive experience. The toilets were reasonably clean (but take toilet paper) and I at least, managed to get some sleep once I got into the rhythm of the train. 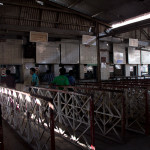 If you wake up in the middle of the night when you’re in a station, you can see all the local travellers getting on and off and as you get close to your destination in the morning, you will see lots of morning markets at the stations. 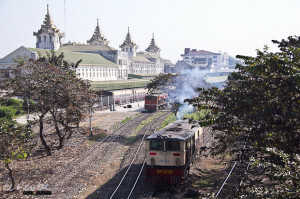 In fact, many tourists take the circular route round Yangon to see how the other half lives. If you’ve come in on the Bagan train, you’ve already seen this, at the right time of day, so you can save your $1 and put it towards a drink at The Strand hotel instead. One note about the Mandalay station. If you have a big bag, negotiate for a taxi straight off the platform. Then you don’t have to carry your own bag down millions of steps with no directions. You won’t be going on this one.